What?!? That is so weird. Who would put eggs in muffin tins? I would. Why you ask? Because Pinterest told me to. Over at The Yummy Life, a wonderful idea was formed. 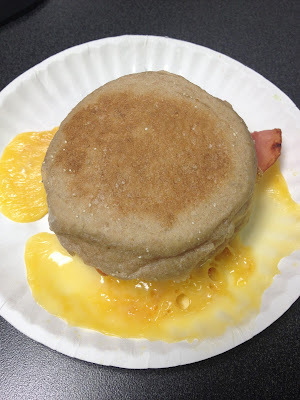 Make your own healthier version of Egg McMuffins! Ok! I'm in! We start by putting eggs in a muffin tin, and breaking the yolk so they are just like at McDonalds. Next bake the eggs at 350 degrees for 10-25 minutes, however long it takes them to completely cook. I cooked the eggs at 15 minutes and I think they were a bit over cooked. The eggs were puffed up and then deflated when I took them out of the oven. Next I set up a small assembly line with low fat cheese and ham in a whole wheat english muffin. You can use whatever meat (or no meat) you'd like. The blogger recommends turkey sausage, which sounded awesome to me, but I didn't have any. Oh no! I forgot to spray the pan with cooking spray! Of course I realized this after I took the eggs out of the oven. Luckily I didn't have to wrestle the pan too much to get the eggs out. Next I wrapped up my little friends in wax paper, and popped them in the freezer. My plan was to grab one a day, and heat up in the microwave when I got to work. The convenience of these breakfast sammies can't be beat. Unfortunately, I have not fine tuned the heating process. I had to warm it up for at least 2 minutes to make sure it was hot and no longer frozen, but that causes the cheese to leak everywhere. TIP: Do not freeze the sammies while they are hot, the condensation from the frozen steam causes your sammie to be soggy. The flavor is great, a lot less calories than fast food breakfast, and this is very easy. If you want to give this a try, just learn from my mistakes, and enjoy!